This is Advance Notice for our annual Sponsored Dog walk on the 9th June at Dimmingsdale! Please note Your diaries! 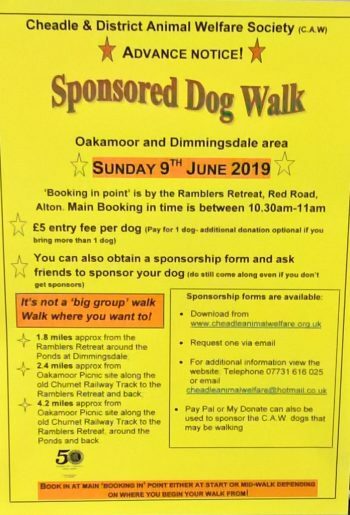 Once again we will be holding a very ‘flexible’ sponsored dog walk around the ponds at Dimmingsdale and/or along The old Churnet Railway Track. Our gazebo and walk entry pay point will be situated outside of The Ramblers Retreat, Dimmingsdale, Red Road, Alton. ST10 4BU http://www.ramblersretreat.co.uk/walking.htm. As in previous years – its very flexible- not a mass walk. Walk individually or in small groups and as far or as little as you want to walk. Its the chance to walk around the Ponds and/or forest at Dimmingsdale and/or the Old Churnet Railway track which will help to raise money for us too! Main Booking in time between 10.30 – 11am (although we will be at gazebo until around 1.30pm for you to see us and/or still book in). £5 entry for your main dog (if more than 1 dog is walking it is optional to pay any more, paying just for the main one is fine).